Hostas are a staple of shady, perennial gardens and are grown primarily for their lush foliage. When properly planted, they’re fairly low-maintenance plants that make great ground cover. Hostas are also very easy to divide and spread, making them a cost-effective solution for large areas of your yard. Here’s what you need to know to grow hostas in your yard or garden. Hostas are plants native to China, Japan, and Korea; though they’ve been grown in the U.S. since the middle of the 1800s. Hostas are an herbaceous perennial that grows in low, widely arching clumps whose tops die down for the winter. When choosing hostas for your yard or garden, it’s important to learn the growing habits and requirements of that particular variety. Some hostas need more room or sun than others. Some varieties of hostas are early sprouters that can easily be damaged by cold northern springs while others struggle in Southern heat. Hardiness: Grow in planting zones 3-8. Hostas need about two months of near-freezing temperatures each winter; and they do not like extreme heat. Light: Morning sun with afternoon shade is generally ideal for hostas, although each variety is different. Soil: Well-draining, rich soil is a must. Hostas shouldn’t be in soggy soil, especially in winter. Amend heavy clay soil with plenty of compost, or grow your hostas in raised beds. Water: During the growing season, hostas often need supplemental irrigation, since they’re native to areas that average more rainfall than the temperate U.S. Planting Timing: As with most other perennials, spring and fall are the best season for planting hostas. If you plant hostas over the summer, they’ll need plenty of water and possibly some sun protection. Soil Preparation: Dig or till the soil about a foot deep, and add a generous helping of compost. If you wish, you can also stir in a sprinkling of balanced, slow-release organic fertilizer. Proper Spacing: Check the label for spacing requirements, and make sure to space your hostas so that they can grow to their full width. Planting Level: Place your hosta in the hole so that the top of the root ball is level with the ground. Don’t bury the crown of the plant. Keep Watered: Water your new hostas every few days until they’re established and have started growing. Dividing and Transplanting: Hostas are very easy to propagate through plant division, but there is great debate about when to divide hostas. I generally recommend dividing hostas in the early fall, about a month before the first frost; but others advocate dividing in early spring, just as the leaves begin to sprout. Spring Care: Hostas will benefit from a sprinkling of balanced organic fertilizer (or an application of compost) in the early spring, just as they begin to sprout. Fall Care: After your hostas have been killed back by a freeze, cut the dead leaves back to ground level and add them to your compost pile. This isn’t mandatory, but the rotting leaves can attract insects, diseases, and nibbling critters. If you’d like, you can leave a few inches of the flower scape as a marker for next year. 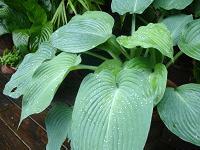 Water: Keep your hostas watered, especially during hot summer days. They may go rather dormant in midsummer. 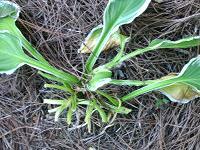 Mulch: Hostas are susceptible to frost heaving and to damage from cold and warm snaps in the spring. A thick layer of mulch will help keep temperatures even. If your hostas tend to sprout too early in spring, add extra mulch after they die down for the winter. Flowers: Hostas are primarily grown for their foliage, but they do have a tall, lovely flower scape that emerges in late summer. Once the bloom is spent, you can cut it off or leave it to produce seed for the birds. Pests: Healthy hostas are like a salad bar for nibbling deer, rabbits, snails, and slugs. Some organic repellents and baits are available, but it can be difficult to grow hostas in areas with lots of animal pests. The photo above caring for hostas shows a hosta infected with a likely virus, probably Hosta Virus X, or HVX for short, and should be removed from this page as there is no mention that it is diseased. Many home gardeners are fooled by this “pattern” and think they’ve found something unique. Please do the hosta world a favor and replace this picture with a healthy hosta! I live in Canada. I have a tree in the front of my yard that gets part sun, part shade. I have been told that there are 2 kinds of Hostas – sun & shade & have been told that I should plant the sun Hostas – what should I do? I live in Arizona where sometime it can get very hot, I have areas around my house that are shady and sometimes cool. Can hostas survive in this climate? I live in zone 3-4…I want to plant Hosta’s in the full sun. What type should I buy? I have a shady small area by the side of my house that doesn’t have much sun. I was told Hostas would grow well in that area. I bought four plants, do I need to separate each plant that I bought, or wait for them to get larger for the section I plan to cover with Hostas? I had problems with mole’s in that section also, which I did put down Grub-Ex for the moles. Will any of this harm my Hostas?? loved your post. I found some Hostas seem to go better in pots. Very helpful article which answered most of my questions. Very Nice, I like your post, Thanks for sharing this type of info..